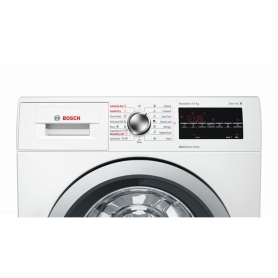 Leaving wet laundry in the machine is a thing of the past with the WVG30462GB Washer Dryer from Bosch. Wash and dry your clothes in one handy appliance so you can get on with the rest of your busy schedule. This model also comes in a classic white to fit in perfectly with any home’s interior. With a 7 kg washing / 4 kg drying capacity and 1500 spin speed, the freestanding WVG30462GB can power through most families’ washing needs. A large porthole and wide opening door make loading easier, while the delay start timer lets you fit washes around when suits you. Just load up the machine, set the timer and get on with your day, knowing the laundry will be finished when you need it. The Reload function allows you to add or remove items once a programme has started – ideal for the odd sock you dropped on the way to the machine, or those clothes you just found under the children’s beds. And, a child lock ensures that curious fingers can’t change any settings or open the door during a cycle. Enjoy some peace and quiet, thanks to this Bosch washer dryer’s AntiVibration sidewall system. The design reduces vibrations and the enhanced insulation helps to reduce noise levels – making it very quiet, even during the spin cycle. VarioPerfect technology allows you to change the cycle settings to either take 65% less time or use 50% less energy – and there are other features to help save time and resources on this ‘A’ rated machine too. Sensor Dry ensures the dryer turns off as soon as your clothes are ready, while ActiveWater Plus automatically adjusts the water needed for a wash. 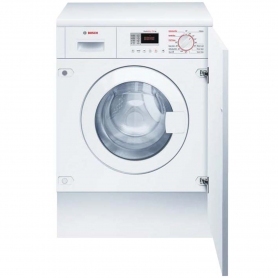 The washer’s drum even has a droplet-shaped structure and paddles, which distributes water faster and more evenly. 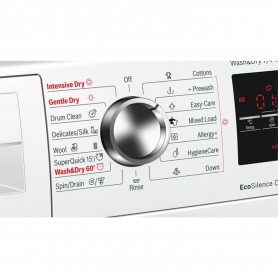 This WVG30462GB washer dryer also features variable spin and temperature options which give each wash optimum conditions. Choose from 15 washing and drying programmes on an LCD display, to guarantee your laundry is cleaned to perfection. Special programmes like Hygiene and Allergy+ are perfect if your family have allergies or sensitive skin. They both work to remove allergens such as pet hair, dust mites and pollen, as well as any leftover detergent from the laundry. The Superquick 15 programme is ideal if you need your clothes ready in a hurry, washing a 1 kg load in 15 minutes flat. Plus, the Wash&Dry programme takes just 60 minutes to wash and dry a small load. 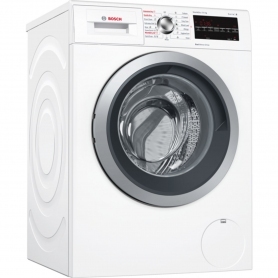 Let the Bosch WVG30462GB Washer Dryer take all the effort out of doing your laundry. Buy one today.